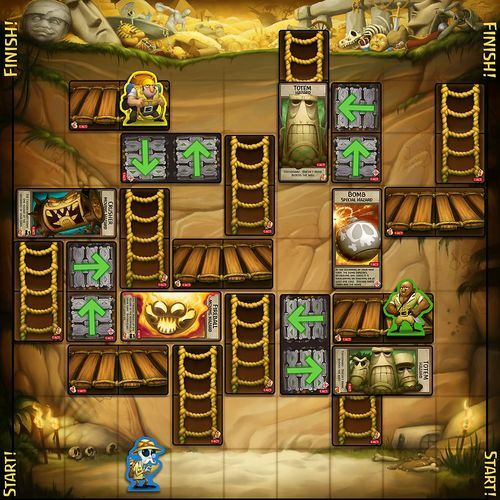 Jungle Ascent is about to be released by 5th Street Games. Not to overstate it, but I THINK I MAY EXPLODE, I AM SO EXCITED! I can honestly say that Jungle Ascent started out as a game I wanted to play. As a matter of fact, I wanted to play the Donkey Kong Card Game. I had lost my copy some time earlier, so I decided to make myself a new one! (Of course, I didn't remember the rules exactly.) I was probably 13 or so at the time. Once I got it working, I realized something. Why not make it cooler? I added new cards and new innovations. What if, rather than building a strait path, you could build any direction you wanted? What if Hazards could move? And if Hazards can move, can they knock you off the path? What if certain cards let you do something special? Soon, I had piles and piles of cards that did pretty much whatever I thought was cool. At this point, the game had evolved into something very different from my original inspiration. I called the new game "Bill Dean's Game of Frab". We built paths that spanned 8 foot tables. We added Forest Fires, Lasers, Dragons, Fire Extinguishers, Wind Elementals, Booby Traps, Catapults, Bombs, Troll Bridges, Speedy Monkeys, and all sorts of crazy stuff. Placement of cards was arbitrary, and movement was ambiguous. But, man, it was fun (for a 13 year old)! My friends and I played this game to death over the course of two years. 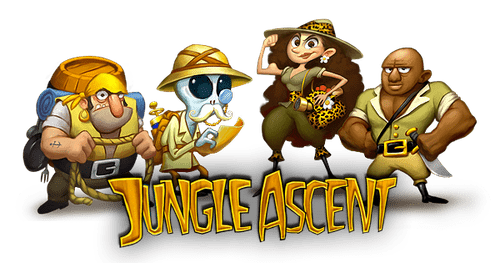 Jungle Ascent evolved in several ways over the next few years. 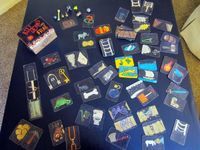 I started researching game design, and I realized that the game was hopelessly over-complicated, ambiguous, and filled with arbitrary rules and zillions of exceptions to rules. I created new digital art for the cards, and I made them 2.5 x 5 inches. The shape of the cards let them fit together like dominoes. That, combined with a large grid on a board, made placement of cards far less ambiguous. I stripped the game down to its most basic elements to make gameplay both functional and clear. I implemented a two action point system and made a board out of a plastic drawer liner. I did many, many playtests on my own, looking at the game critically and for ways to break it. How could creative gamers make my system fail? How could it be exploited? What would I least want players to do? I tried every strategy I could think of. I tried to set up every situation that would lead to conflicting rules or other problems. I removed cards that were unbalanced, redundant, too complicated, or not cool enough. I removed unnecessary rules. I even began removing cards I liked, just to see if the game worked better without them. Once the game was functioning very cleanly, I began showing it to my friends again. They were glad to see it, and once again thought it was fun. I asked them to be harshly critical, and based on their feedback, I removed a few more things. I also added some of their ideas, like conveyor belts. That was a good one! I finally wrote the rules, as well, with the help of a technical writer friend. They have been revised repeatedly since then. What happened next was crucial! I asked if Game Night Games (my FLGS) would allow me to playtest my game at an open gaming night. As luck would have it, the man I asked was Phil Kilcrease, the facilitator for the Utah Boardgame Designers Guild! I remember his response started with "Funny you should ask". I joined the guild, and I brought Bill Dean's Game of Frab to be tested as soon as I was eligible. I can't tell you how helpful that was. The people at the guild were friendly and excited about each others' games, but they were also critical, and really smart. Many people in the guild had published games with a variety of publishers already, so they were experienced, too. They quickly pointed out problems with my game. Some rules were still confusing and inconsistent. Many cards were miserably overpowered. The end game had some serious problems. BUT- every time I brought the game, the players HAD FUN! For the first time, strangers were playing it, and they liked it. The guild members also pointed out that I had no cohesive theme. The board was a blank grid, and you were climbing up... What? Why? They were right, and this bothered me. It was still just a bunch of cards that, while I thought they were cool and fun together, were pretty darned unrelated. I tried on several themes to see if they fit. Climbing a Wizard's tower? Not original enough... Semi-powerful demi-gods sending their minions to do the dirty work of claiming some artifact of ultimate power? Closer! The cards didn't seem very god-like, though. One day, a guild member (Brian Kelley) mentioned the History Channel's "Ancient Aliens" show. I immediately had my inspiration! The game was about an ancient treasure hoard amassed by a race of time travelling aliens, and protected by ancient jungle magic! (That's not too weird, is it?) You had to climb a dangerous cliff to get it. This would allow me to keep all my oddball cards and still have the game at least kind of make sense! Kegs, Gates, and Fireballs became stone idols of different sorts. The Troll became a Golem. Rocket Shoes remained Rocket Shoes. 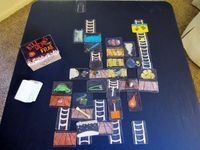 “Bill Dean’s Game of Frab” became “Jungle Ascent”. In order to fix the many problems pointed out by the guild, I tried tons of things. I wanted to make the game more strategic. I tried numerous card drafting mechanics, including a few ripped from other games. I added effects that required bluffing or guessing an opponent’s move in advance. I made some overpowered cards harder to play. Some of these worked, and some of them did not. I once more removed cards that seemed broken. The game’s mechanics now worked well. The game had become consistently fun. I found the most important thing I could do at this point was to adjust card distribution in the deck and individual card powers. This took FOREVER, but it fixed most of the balance issues between cards, as well as some end game issues. I played so many solo games, adding to the deck, taking away from it, tweaking cards, and trying it again. Particularly, I wanted the game's pace to be FUN, and I wanted players to always have interesting options. Once it was really working great, I began adding some of the crazier cards back in. Because the base game had been so greatly improved, a lot of these became really fun. I've got to thank Sarah (then my girlfriend, now she's my wife). She helped me a ton in playtesting, in prototyping, and with encouragement all along the way. She's been more involved than anyone (and she's looking forward to having our lives back when this is all finished). Thank you, Sarah! With tons of playtesting at the guild and elsewhere, and after many modifications, I finally felt Jungle Ascent was ready to be shopped around to publishers. I entered the game in Salt Con’s Ion Award competition. I got some interest from a few publishers, so I chose one, and sent them the game. Meanwhile, Phil (the Board Game Guild Facilitator) had started 5th Street Games. He had seen my game evolve at the guild meetings, and he wanted to publish it, but I was still waiting for feedback from the other publisher. They responded positively, but very slowly. So, after a year of waiting, Phil offered to publish Jungle Ascent again, and I took him up on it! Now, Jungle Ascent has launched on Kickstarter! I cannot express how excited I am! I hope you all enjoy the game. It’s been a really long process, and I can hardly believe it’s come this far. •	1:2 card ratio. This allowed for freeform play that made sense. 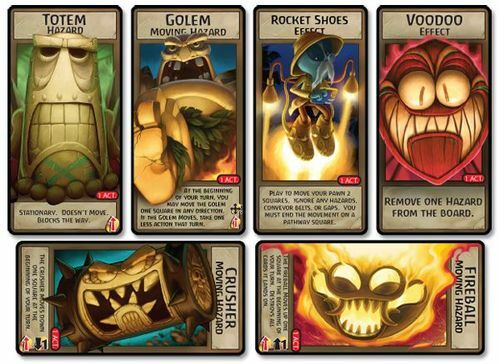 •	Moving Hazards and Hazards that destroy cards. •	Ownership tokens keep track of ownership AND limit the number of Hazards in play. •	Gravity! You can be knocked off the path by moving Hazards. •	2 Action Point system. Not original, but it really works in this game. •	Conveyor Belts. Thanks, Dennis! •	Lots of fun effect cards! •	We used to play the game without a board. It was totally freeform and arbitrary. ("I say those cards are touching." "No, they're not!") I also axed the 8 foot game length. •	Hazards originally each had a "Remedy" that only removed that specific Hazard. So, the deck was full of Remedies. 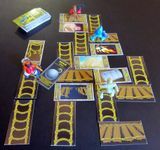 At first, I allowed players to use Remedies as pathway cards, but only if their corresponding Hazard was not in play. That’s a terribly convoluted mechanic… Forgive me! This was before I did any study of game design! And, heck, I was in middle school. •	Words like "Pre-turn Phase". •	Anti-Leech Cards! They were bridges you stepped on which then moved forward carrying your pawn, and placed a Hazard behind you. 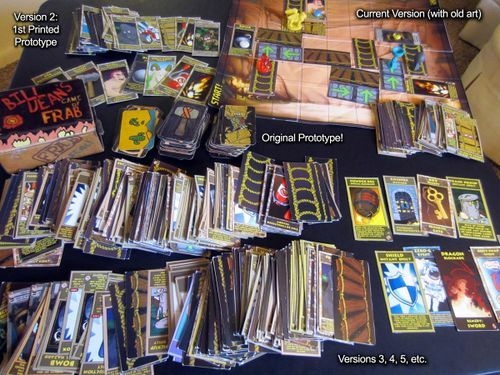 You had to remove that Hazard from the deck and set it aside at the beginning of the game. See? Too complicated. •	Lots of odd Hazards- Desert, Dragon, Tornado, Wind Elemental, Powder Keg, Forest Fires, etc. •	Body Swap! Dang, that card was so broken. Too bad. It was very thematic. •	Zero-Gravity. Actually, this made it in, but, it’s been modified. It was too fun to cut. •	Booby traps that would allow a player to spontaneously break any pathway card. Too powerful! •	Numerous card drafting mechanics. These were very valuable to try, but I eventually found a much simpler solution. •	Unlimited numbers of Hazards on the board. Oh, boy, that was problematic. •	5+ Players. It's not so pretty with that many players. •	The idea that making a board game would make me rich. Oh, well. •	You don't need a patent. No one is going to steal your idea. •	You need strangers to play your game and love it. •	Make a game you want to play! •	Think of everything cool you want your game to have. Try it out! Some of it might work. But, don’t be afraid to kill your favorite parts if they don’t work. •	It may help to take a long break from your design and come back to it later. Hi Brian, I absolutely loved your story. I am a backer of yours on kickstarter; because I loved the theme and the artwork (and the whimsical nature of your game): top stuff! So when's the next game out? Count me in!